High Definition and Standard Definition Baseband Picture Quality Measurement and Video Quality Analysis Device. 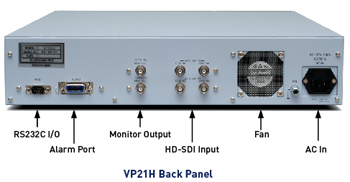 The VP21H is a powerful high-picture quality measurement and analysis device for Baseband Video (HD/SD SDI). The VP21H achieves automated, real−time picture quality measurement and analysis by comparing the source and the tested video. Our patented “Video DNA” Technology gives objective evaluation that highly correlates with subjective testing according to ITU-DSCQS* standards (see ITU Recommendation J.144). Video synchronization is done automatically and video quality analysis is at the pixel level. 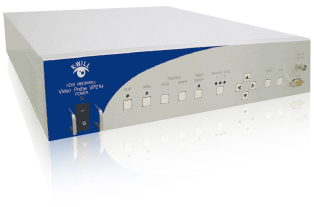 The VP21H is ideal for CODEC evaluation, Quality Control and HDTV/SDTV system performance improvements. Automatic Synchronization without any markers. The time differences between the source video and test video (within 8 seconds) are synchronized automatically. Front Panel Push Control or PC-based control for configuration, logging and monitoring with GUI via RS232C.